The Kashmir Valley with a gallery of Peaks in the background. These Peaks belong both to the main Himalaya as well as the Zanskar Range. Visible in the pic from the left are the Kotwal Peak, the Harwar Peak, the Mahadev and the highest Peak of the Valley, the Kolahoi Peak and the Buttress Peak to its right. Below in the Valley floor you can see the road which comes from Srinagar to Gulmarg as it snakes it’s way up the Valley. 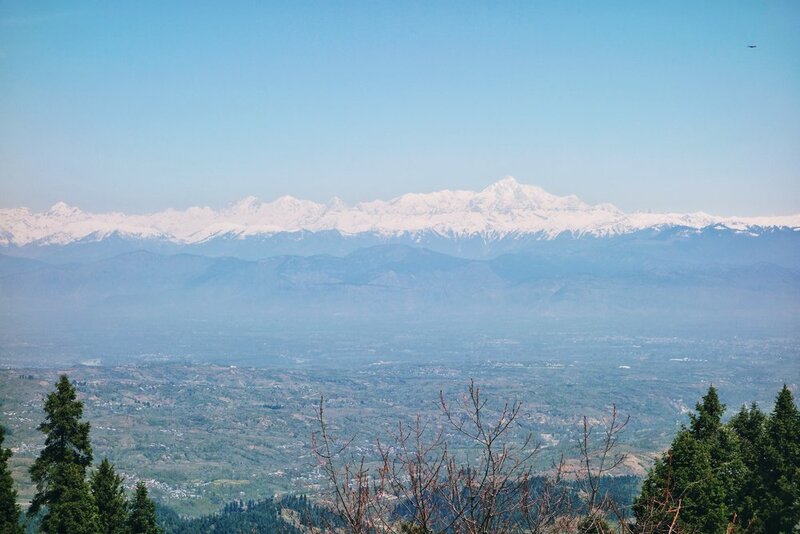 This view of the KashmirHimalaya is from the Pir Panjals where Gulmarg is located. Not in the pic to the left are the Haramukh and further left is the Nanga Parbat Massif. To the right of the pic are the Nun Kun and the Peaks of the Kishtwar Himalaya like the Brahma. Of course you have to be a lucky person to get clear weather and get to see all Peaks. While I was there I could never really see much to the right of the Kolahoi. In your next trip to Gulmarg (whenever that is) please try and capture these Himalayan giants. Pic from April 2016. Gulmarg, Kashmir.